Deliverables: Action Plan (ES). Agreements with farmers (ES). Deliverables: Report on organisations, experts, projects and Transitions from dry to irrigated farming(ES). List of mitigation projects(ES). Expert panel(ES). .-soil organic carbon fixation (CO2 balance). Different studies developed by INTIA and UPNa show that the quantity of organic carbon that can be accumulated in irrigated farming soil varies to a large extent depending on the type of soil and current crop. 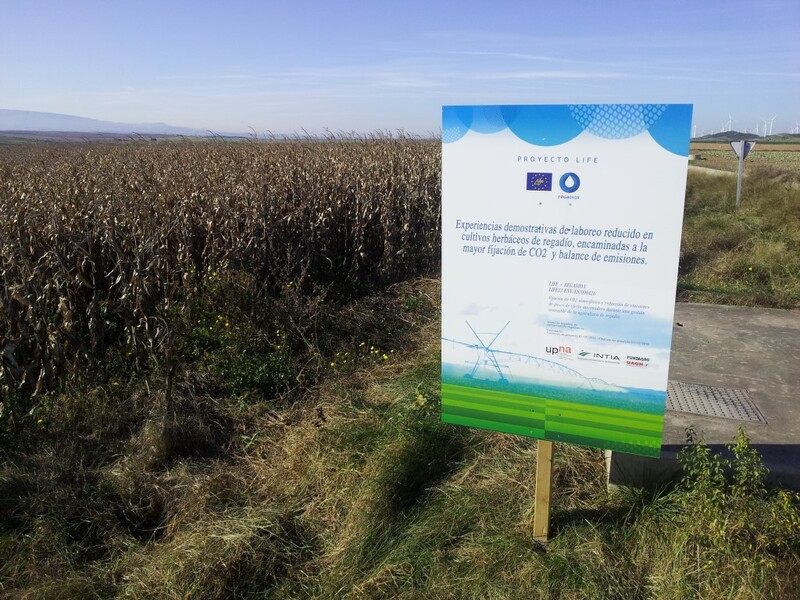 This is precisely one of the objectives of the project: demonstrating that different crop managements may yield different carbon sequestration rates. The use of parcels in different irrigation areas and with different irrigation times will enable to identify the different not only in carbon sequestration but in sequestration pace and rate as well. Deliverables: Final report on the demonstrative experiences developed in this action(ES). Deliverables: Final report on the demonstrative experiences developed in this action (ES). Greenhouse Gas Emission Reduction (emission balance). Previous studies developed by INTIA to identify CO2 emissions in extensive farming production processes have found out that emissions resulting from nitrogen fertilizing are a critical point in the process – accounting for 35% of emissions in the production process. Most of these are indirect emissions, coming from the manufacturing process of inorganic fertilizers. Thus, an efficient me thod to reduce emissions can be the replacement of part of inorganic fertilizers by organic fertilizers – and subsequently study of CO2 emission factors of using organic fertilizers. .
Deliverables: Final report on the demonstrative experiences developed in this action (ES). Protocol for conducting energy audits in parcel irrigation systems (ES). 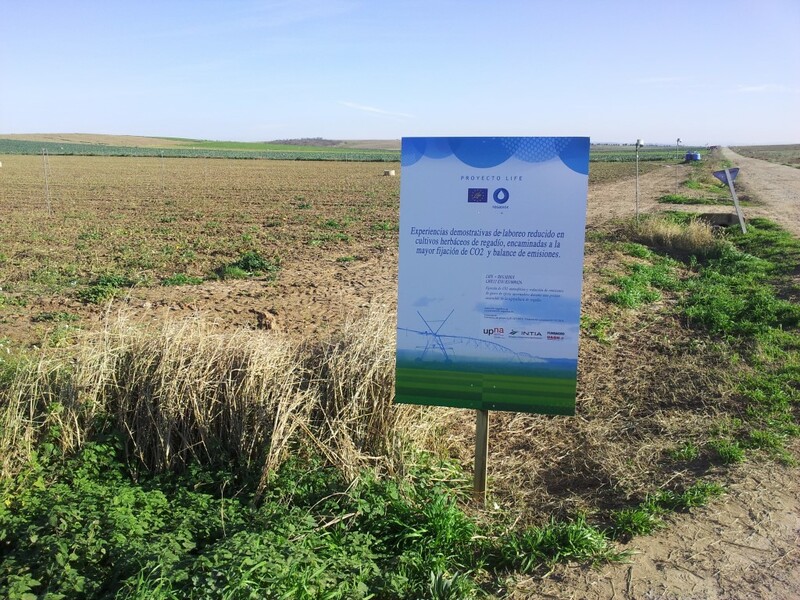 Guide of energy-focused Good Practices of irrigation systems in parcels (ES). 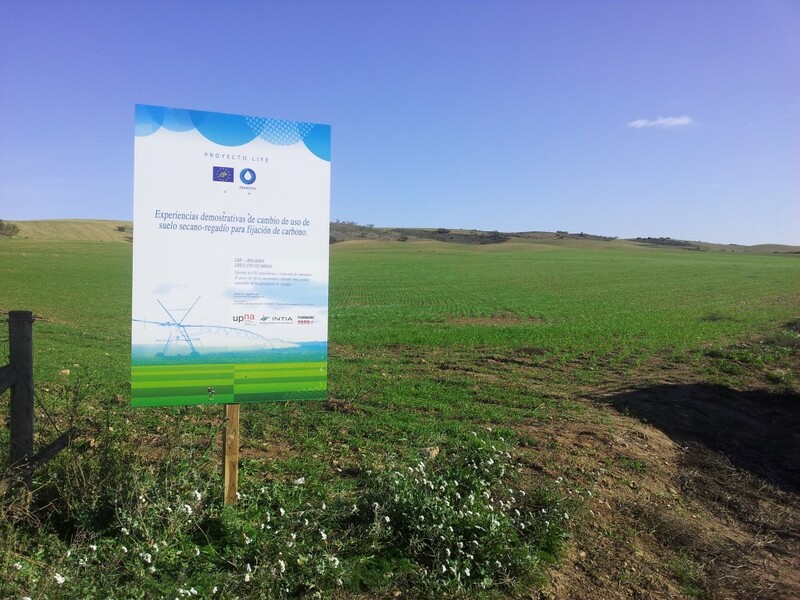 Within the project, this action is oriented to reducing energy consumption in irrigated farming by reducing the minimum pressure required in the parcel to maintain the right pluviometry of the irrigation system. The action proposes using new materials and designs to evaluate the materials and the working pressures. Drip irrigation frameworks in extensive crops. Energy audits and farmer surveys. Promote soil management practices that increase the soil’s content of organic matter in the medium term (use of compost, plant residues, suppression of field work, implantation of vegetable cover, etc.). Encourage farming practices that involve a more efficient and sustainable use of nutrients, energy and water, and a bigger sustainability of agricultural Works. The purpose is to monitor the environmental impact indicators and to appraise the socio-economic impact of the Project. Deliverables: Style guide and project logo. Brochure. Bulletins (ES): October 2015, February 2016, April 2016, July 2016, November 2016, December 2016. Deliverables: Press coverage report. Final dissemination seminar. Regional events. Final European dissemination seminar. Deliverables: Lyman Report of the Project (ES_EN). The actions in this section (development of communication materials and tools: information panels; web site; communication plan; training, skilling and mainstreaming programme) seek to enable the sector as a whole to easily apply the type of farming management tested under the project in order to attain a significant reduction in greenhouse gas emissions from the agricultural sector.